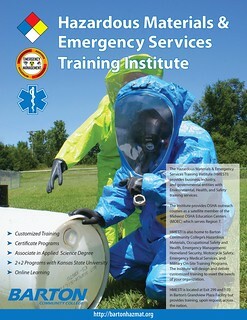 The Hazardous Materials & Emergency Services Training Institute, (HMESTI) provides business, industry and governmental entities with Environmental, Health and Safety training services. The Institute is now an OSHA Training Institute Education Center as a member of the Midwest OSHA Education Center (MOEC) Region 7. HMESTI is also home to Barton Community College's Hazardous Materials, Occupational Safety and Health, Emergency Management/Homeland Security, Emergency Medical Services and Military On-Site Training programs. The Institute will design and deliver customized training to meet the needs of your organization. HMESTI is located at Exit 299 and I-70 in Barton's Grandview Plaza facility. Upon request, we can provide training across the nation.